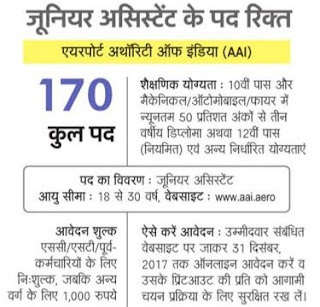 AAI Junior Assistant Recruitment 2017 Application is invited to fill 170 Airport Authority of India JA Vacancies, to Apply Online Read More details. PM Sahaj Bijli Har Ghar Yojana is also called Pradhan Mantri Saubhagya Scheme which mains objective to provide electricity to Human in the name Electricity For all. 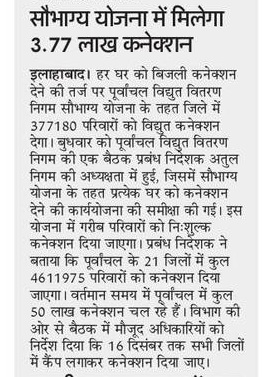 Under this PM Saubhagya Scheme applicant has to register in place of Power House or camp organized by Junior Engineers. They have form in the name of Saubhagya Scheme Application Form or Har Ghar Bijli Yojna (Free Electricity to All) in the category of 1 Kilowatt to 3 Kilowatt. Both domestic and Commercial (having 1,000 square foot field) can apply in UP Saubhagya Scheme. Pradhan Mantri Sahaj Bijli Har Ghar Yojana is a central government scheme of total budget 16,000 crore.